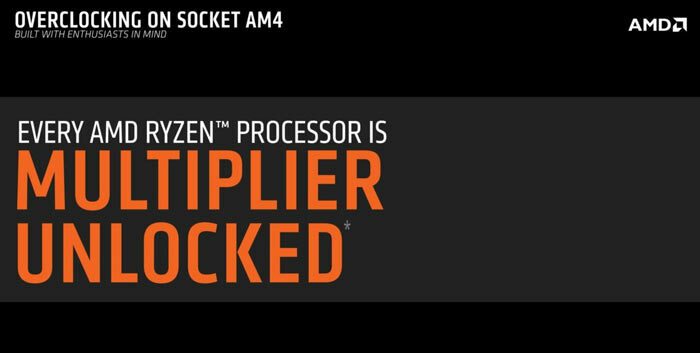 Some new AMD Ryzen slides have come to light confirming that "every AMD Ryzen Processor is multiplier unlocked". In further positive news, for those waiting for the time they can get the parts to build their first AMD Ryzen system, AMD is aiming for a simultaneous launch and availability date ahead of the end of the Q1 period. So far we have only seen AMD trumpeting the qualities of their upper echelon 8C/16T Ryzen CPUs. Of course AMD will be making other Ryzen chips available but we don't know what other core configs will be released and how many of each etc. Infoworld's Brad Chacos was told by an AMD exec that there "will be a full product stack at launch" so we could realistically speculate there will be lower echelon 6C/12T and 4C/8T processors fleshing out the product range. 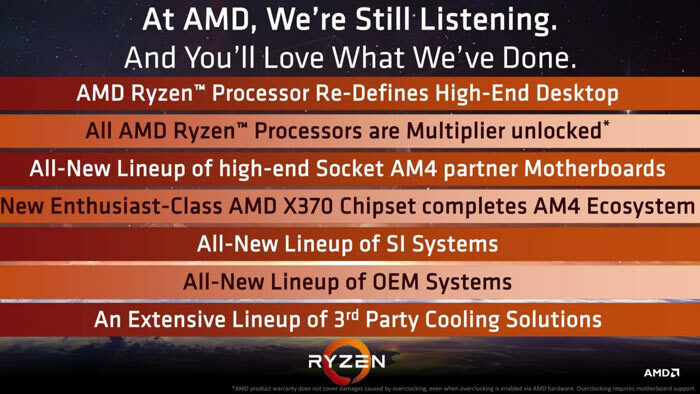 As mentioned in the headline, enthusiasts will be happy to learn and see confirmed by the presentation slides, that "every AMD Ryzen Processor is multiplier unlocked". Of course overclocking potential is unleashed by your choice of motherboard, and to OC you will need a product with X370, X300, or B350 chipset. Another interesting titbit concerning motherboard choice is that for SLI/CrossFire you will need an X370. We already know that AMD is aiming for a Q1 2017 launch for Ryzen. This won't be a paper launch and you will be able to buy Ryzen chips from launch day according to AMD's Jim Anderson. When companies say things like Q1 or H1 we often expect the launch to be on the very last day from the selected range. That's just how things seem to work, or even worse, things get delayed. However, AMD's Robert Hallock said that "The very last day of Q1 is not our trajectory". So we won't have to wait until the end of March, we could even be looking at a Feb launch. There was one further interesting nugget of Ryzen info from CES. PCWorld reports that Mark Papermaster, AMD's chief technology officer, confirmed the Ryzen processor series will have a four-year lifespan. That's about average for an AMD chip range and we should expect three or four iterations of Ryzen CPUs before a new architecture supplants Ryzen. So the 17th of Jan has morphed to Q1? Do we reckon this could spur on Intel to scrap their whole K scheme? I bought into a K processor, because I want to be able to overclock my components, but I'd much rather not have to pay a premium for this. I know someone that is purposely waiting for these CPUs instead of investing into Intel, for that exact reason. Unless AMD really release a beast that costs very little, I doubt Intel will change how they sell CPUs. and another delay for AMD? It's not like they are putting any pressure on Intel. Looks like it, though I'm thinking there will be a combined launch with Vega cards and maybe even combined special offers. Vega will come afterwards. While the engineering for Vega is most likely finished (the hardware part, but the driver team will use the delayed launch to optimise their drives as it appears that Vega and NCU are a big change from previous GCN designs), AMD most likely doesn't have manpower to launch two products at the same time and Zen will take priority.